What is Probate? Is there always a Probate? How does California Probate Work? When a person dies, their last will and testament (assuming they prepared on in advance) is handled and their wishes for the distribution of their personal property implemented through a process called probate. Probate simply means the procedure by which their last written directives are legally certified as the final statement of their wishes in regard to their worldly possessions (including any property or properties they may have owned). It also confirms the appointment of a person or entity the deceased person selected to administer their estate. 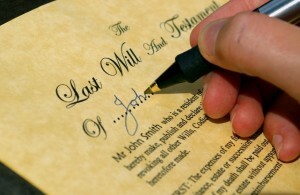 The term probate is also frequently used to refer to the entire process of “probating” an estate. In this usage, it refers to the entire process that gathers all of the available assets, pays any outstanding debts, taxes, administrative expenses and then finally makes the specified distribution of remaining assets to those persons or entities designated by the will. The personal representative (also know as the executor or executrix) who is named in the will is legally in charge of this process and is responsible for handling the orderly method for administration of the estate as set forth by the probate laws and procedures of their state. The executor is typically held accountable for their actions and decisions by the heirs and other beneficiaries and in some cases may be formally supervised by a probate court. If a will does not exist or a personal representative is not designated in the will, the court will appoint one (assuming there is personal property to distribute). The personal representative is often entitled by law to a reasonable fee or commission for their services. Probate law generally encourages or provides for partial distributions of funds during the period of administration and assets are often distributed “in kind” rather than sold during this period. Tax laws generally look to the personal representative as being responsible for making death tax filings and other tax payments from the outstanding assets of the deceased. Therefore, choosing an executor / executrix / personal representative is an important decision. The basic job of administration and accounting for assets must be done whether the estate is handled by a personal representative as part of the probate process or if probate is avoided. In the recent past, lawyers and other professionals have advocated the use of probate avoidance techniques (such as revocable trusts, etc.) in states where the probate process has been seen to be too slow and overly expensive. In recent years, many states have simplified or streamlined their probate processes and in such states, there is now less reason to employ probate avoidance techniques.Tisn’t always necessary. If the deceased person owned assets in joint tenancy with someone else, or as survivorship community property with his or her spouse, or in a living trust, those assets won’t need to go through probate. The same is true for assets held in a revocable living trust and accounts for which a payable-on-death beneficiary has been named. Is there always a Probate? There isn’t always a Probate. In California, Probate is not always necessary. If the deceased person owned assets in joint tenancy with someone else, or as survivorship community property with his or her spouse, or in a living trust, those assets won’t need to go through probate. The same is true for assets held in a revocable living trust and accounts for which a payable-on-death beneficiary has been named. How does California Probate Work? Most probates in California are handled under the state’s Independent Administration of Estates Act, which lets the executor take care of most matters without having to get permission from the probate court. (Cal. Probate Code § 10400 and following.) The executor can usually sell estate property, pay taxes, and approve or reject claims from creditors without court supervision. Certain other acts—for example, selling real estate—require court approval. Probate has always been a puzzling, obscure process for most people. We have all heard of long, drawn out judicial processes and Probates with unknown heirs showing up to contest a will… Even if you know someone who has gone through the Probate process, the word Probate usually conjures up images and emotions that we would rather never have to see or feel. Probate is usually very simple and systematic. The dedicated staff at the Sacramento Probate Assistance Center provide Probate information and access to all probate and estate services. Come here regularly, we post regularly here at the Sacramento Probate Center. We are licensed to give Sacramento Probate Real Estate Help to families and also have a team of caring, qualified, experienced specialists to assist you with every aspect of your families needs. Questions? Concerns? Every single probate situation is different. All are challenging, We can help you. Call us today. We are your Sacramento area Probate Real Estate Experts! Sacramento Probate Assistance Center provides Sacramento Probate real estate information and access to all probate services. We are licensed to give Sacramento Probate Real Estate Help to families and also have a team of caring, qualified, experienced specialists to assist you with every aspect of your families needs. This entry was posted on Thursday, July 30th, 2015 at 5:28 pm	and is filed under PROBATE REAL ESTATE LEARNING CENTER, Sacramento Real Estate, Sacramento Short Sale and Sacramento Foreclosure News. You can follow any responses to this entry through the RSS 2.0 feed. Both comments and pings are currently closed.